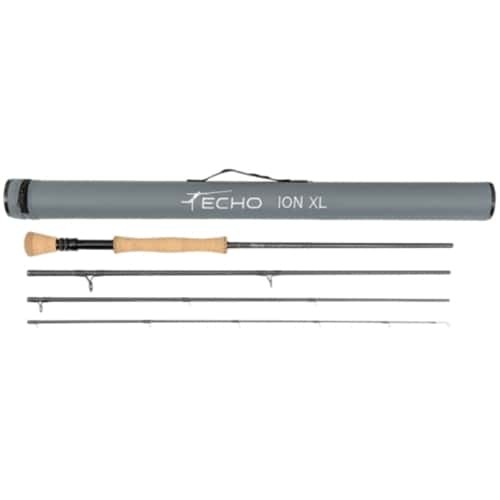 Echo Ion Fly Rods - Casting large flies into a stiff breeze is best done with high line speed and tight loops. Fighting big fish often requires rods with a stiff back bone. Creating a rod that can do both was the reason ECHO ION rods were created. A rod that is too stiff can be difficult to cast. If you plan to cast all day and still have enough arm strength to drive home you need a rod with just enough stiffness to get the job done. You might be tempted to buy the ECHO ION because of its matte stealth grey blank, but we think you should buy one because of its perfect blend of action and power. New for 2016 are classy appointments and an overall drop in weight.